Sobers Sethi, Vice President, Axalta Coating Systems and President, Emerging Markets presenting donation to OzChild Executive, Mark Powell. 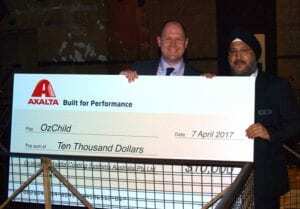 Axalta Coating Systems was thrilled to present children’s charity OzChild with a cheque at its recent customer event held at the Old Melbourne Goal. Axalta supports local initiatives, especially those organisations that focus on using STEM education (science, technology, engineering, and mathematics) to promote young people to have successful futures. 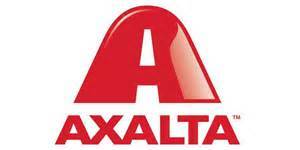 For this reason Axalta proudly supported OzChild through its most recent promotion called Built for Performance. Not-for-profit charity and support service OzChild, works with more than 6,000 young people and children across Victoria, New South Wales and the ACT. Through foster and kinship care, education and development support and disability services, OzChild is able to build stronger families, care for young people in disadvantaged circumstances, and support them in reaching their full potential. Thanks to the overwhelming participation by Axalta business customers, a donation was presented to OzChild’s Director of Finance and Planning, Mark Powell by Axalta’s General Manager Steven Brett, at the Old Melbourne Goal on 7 April 2017. Danny Buzadzic from Western General Bodyworks Group and Vaughn Pappin from SmashCare also donated to the charity, helping to further OzChild’s work in giving Australian children the best opportunity for a bright and rewarding future. If you would like to show your support to OzChild, please go to www.ozchild.org.au/donate. Editor: As always it is good to see the industry supporting worthwhile charities such as this.